It was so good to see such a massive crowd at the Ochre Christmas Party and I really appreciated your goodwill during my talk which wrapped up my residency at Ochre Print Studio. At the risk of repeating myself, it has been one of the most challenging, stimulating, knowledge-building, and totally human experiences of my life. I have to thank the management team – Annee, Jai, Jule, Mai, Emma, who somehow seem to keep this superb facility on an even keel; my fellow AIR, Helen with whom I seemed to fathom most technical mysteries that arose; my fellow printers from Open Access, on courses and key holders who shared their ideas, techniques and often their angst; to tutor Ruth Barrett-Danes for showing me her print collection and sharing a “love of the dark” with me; all the previous AIRs and artists who attended my group crits and offered help and gave feedback. 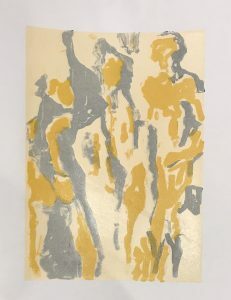 I also want to show how much I have appreciated working in the studio at the same time as a really caring group of volunteers runing the happy and calm Thursday Ochre Print ABLE sessions. This residency has also given me opportunities to curate exhibitions, run workshops and learn new printmaking skills as well as to make new friends. 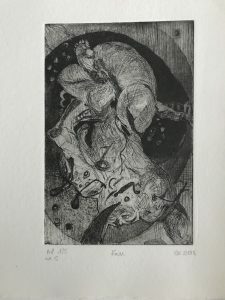 The residency started at a really good time and I was very keen to improve my etching skills and delighted that one of the first workshops of the year was on the great etcher and visionary, William Blake,the experimental 18th century innovative printmaker. Michael Phillips delivered the workshop and has studied the technical process of producing a Blake etching plate. How he wrote backwards on the plate in varnish (as stop out), etched it in acid and then relief printed from the plate. 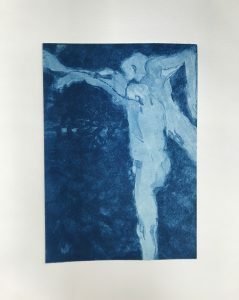 Using photo etching techniques, Michael had reproduced many of the lost Blake plates, so we all had a go at printing using hand mixed pigments similar to Blake’s own. Mai Osawa, who has brilliantly set up a least-toxic etching environment here, and who totally underplays her expertise, has mentored me through the etching process. I made this small Blakeian plate with Mai’s guidance and was then able to take full advantage of Katherine Jones’ new techniques in aquatint and block printing. A great influence through much of my year has been Tuesday evening when the Textiles group meet. (I call them the subversive stitchers after Rozsika Parker’s book/exhibition which brought the private world of female domesticity into the fine arts and caused a major breakthrough in art history and criticism). Seeing the strange and creative items they stitch together, overhearing their discussions, and appreciating their willingness to share and explain, I always learned something on a Tuesday night. I produced this image on the photopolymer course, which is an excellent technique for producing subtle tonal differences which was selected for Woolwich Contemporary Print Fair recently. Because of the first rate facilities here, one of my objectives was to learn how to screen print. I admired an architect on the beginners course create a 4 layered, stencilled image of buildings on Southbank, all minimalist and perfectly aligned. Fellow students Martin and Laura also produced amazing layered figurative images and have been well and truly bitten by the printing bug. And of course I took plenty of advice and guidance from Adam, Annee, Helen and Jule. But in the end you just have to get on with it, find your own way and take a lot of plunges. 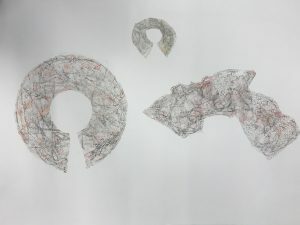 During the Residency I have been working on a project that will form a solo exhibition at Sevenoaks Kaleidoscope Gallery in October 2019, based on the 1786 hanging and gibbeting of three men at Hindhead. I exhibited some of this work in progress at the Ochre Christmas Party and I will continue to work at the studio in 2019 to complete it, so I hope to see you then. Thank you to everybody who made me feel welcome and valued and who participated in my residency in one form or another. It has really led me to appreciate the value of being part of a sharing community, for which the peeling back of paper from the plate or screen is the greatest passion!